Room Coordinators are one of the most important parts of our organization and help keep the dances happening! Manage the Door/Entry – be one of the first faces dancers see as they arrive for the dance! Manage Volunteers/Work-Traders – Get to know dancers off the dance floor! Room Coordinators is truly a great contribution and service to the community. If you’re interested in understanding more about Sociocracy/Dynamic Governance, non-profits or just AMC and how it works, Room Coodinating is a great first step! Get experience necessary to serve as the Volunteer Coordinator and other AMC jobs. Get more information about being a Room Coordinator or other ways to help! Volunteer/Work Trading is also a great first step to understanding the Room Coordinator position. 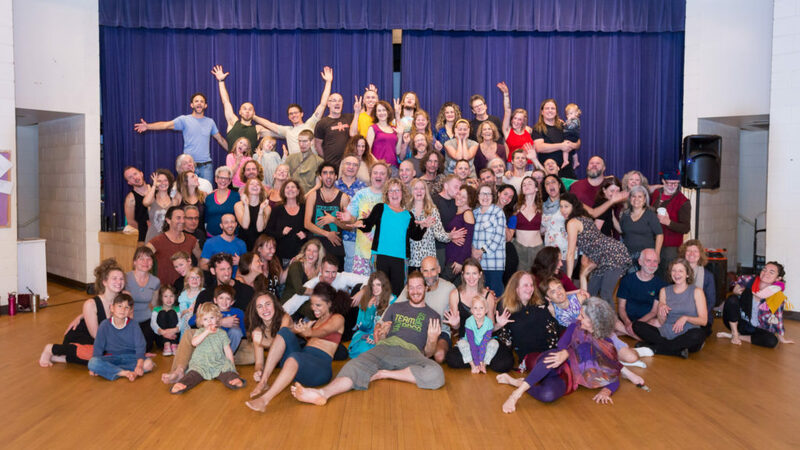 Asheville Movement Collective in 2017 and beyond! The close of 2016 marked great transition for the Asheville Movement Collective which has blossomed in 2017 with a revitalizing community and much excitement about 2018! Donate to AMC in 2017: AMC is a 501c3 Non-Profit, which means your donations are tax deductible. Give today to get a 2017 tax deduction for your donation! Finding suitable venues for our size event in Asheville is no small task. We’re honored and appreciative of the Jewish Community Center (JCC) for being able to use their space (almost) every Sunday for their dances alongside other community events. Having a regular venue space with the amenities of a place like the JCC (affordability, size of space and quality of floor, storage, a childcare room, parking, etc.) is invaluable. We thank the JCC for making space for the Asheville Movement Collective to thrive! We look forward to continue our collaboration and to dance at the JCC in 2018. A more distant vision is the creation of our very own building to call home. We hope to make the first steps to that journey (probably the initiation of fundraising to seed larger Grants through a floor fund) in 2018. We are always looking for possible venues and supporters, don’t hesitate to get in touch to make recommendations or connections! In 2017 AMC facilitators have also put extra emphasis on collaboration, working with past AMC facilitators and community guest DJ’s including local 5Rhythms© instructors to host special events; and more live music to boot! Not only that, when the JCC does need to displace our dance for other events, we have collaborated with the Warren Wilson College’s (WWC) Wellness Crew to put on very successful dances at WWC’s the outdoor Pavilion and the Bryson Gym. As has become a tradition, we also had a Christmas dance & fundraiser for OurVoice (a local nonprofit that supports sexual abuse victims). This year our dance community contributed $500 plus supplies to support victims of human trafficking. We are excited about outreach, working with children and diverse populations and those who don’t have context for freeform movement as a practice. This is a part of our vision for 2018 in addition to the recently created Special Event Framework, which was created with goal of making collaboration and live music events easier to produce. Look forward to more & better collaborative events is a goal for 2018! We are also inspired about creatively collaborating and interfacing with the growing Asheville dance community. AMC is a community run organization. That means the people who make AMC happen are all dancers themselves, and moreover that there are many ways for dancers to help make AMC happen. It’s a very ‘choose your own adventure’ kind of organization with many different ways to participate. Recently CJ O’Reilly was elected as the new Volunteer Coordinator and is also tasked with revamping the childcare program. We are always eager to bringing community members into the fold, whether it’s helping with miscellaneous tasks, serving as a Room Coordinator, or otherwise. We recently realized an interesting fact : if every AMC regular (over 200 dancers) volunteered once or twice a year, then the volunteer calendar would be completely filled! When you volunteer, you actually get 2 free dances (including the one you work, which you can dance for)! Volunteering is a wonderful way to understand more about how AMC works and get to know the community beyond the non-verbal space of the dance floor. There are childcare volunteers too! (They get to dance – for free – and support by checking in and helping kids move between the childcare room and their parents in the dance space). In 2017 childcare attendance has doubled. We are in the midst of re-working our child care program by creating a more cohesive oversight system, secondary and backup providers, and clearer guidelines and a limit of 10 children per provider. The Asheville Movement Collective is a 501c3 Non-profit organization which uses Dynamic Governance (A.K.A. Sociocracy), a modified consent based decision making process, to make governance decisions. We maintain a regular meeting schedule, complete with minutes, and ample avenues for community involvement.
. We ask that you commit to attending a series of 4 meetings in sequence of 6 months. Check out our Joint Circles meeting schedule. This is a great first step to becoming an AMC facilitator as well! In Dec. 2016 AMC facilitators Marta Martin and CJ O’Reilly stepped into the roles of Interim Executive Director and Interim Executive Secretary. This was in the context of completely depleted financial reserves, and not enough money in the bank to pay the existing executive director, events coordinator and volunteer coordinator. This was to very high venue costs (at the Masonic Temple), low attendance (varies seasonally and year to year), and administrative overhead. Jane Smolnik stepped up as Volunteer Coordinator and served for the bulk of 2016 as well. Our team is larger than that however, with a handful of RC’s who fill in in other capacities as well. You’ve surely seen us on the dance floor, but you may not know what else we do! Through the good fortune of our new supportive venue (the JCC is very affordable in comparison), and slashes in operational and administrative overhead, AMC has rebuilt full operation and rent reserves as well as additional savings which is now being put into bringing back online overlooked operational elements (the event coordinator position), improving our childcare program, and more. More on AMC’s vision for 2018 to come! What visions do you have for Asheville Movement Collective? When you help setup or break down a dance, you support AMC's community and dance for free! Find out about other ways to Participate in AMC! AMC is a dancer-supported community. There are many ways to give—find one that resonates with you. Do you like working with Children?Find out more about how to participate in or use our Childcare Program! Asheville Movement Collective is a 501(c)(3) nonprofit organization. Spread the Word! Vote AMC Best of WNC "Best Place to Dance"! The "Best of WNC" Mountain Xpress Readers Poll finishes April 30th. 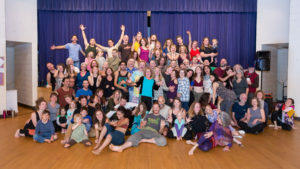 Is "Asheville Movement Collective" the "Best Place to Dance"? Tell them!